A low carb bar with a chocolate coating! Buy 1 get 1 half price on Combat Crunch this month. Add 2 to your basket and the cheapest will be half price. Free UK delivery on all orders over £30! Ingredients:protein blend (partially hydrolyzed whey protein isolate, milk protein isolate, whey protein concentrate, whey protein isolate), Isomalto-oligosaccharide (Tapioca fiber), Palm Kernel oil, Peanuts, Partially De-fatted peanut flour, Sugar, Natural Flavours, Maltitol, Rice Flour, Cocoa Powder.. Contains less than 2% of: Glycerin, Tapioca Strach, Cocoa Powder (Processed with Alkali), Sunflower Lecithin, Salt, Calcium Carbonate. Allergen warning:manufactured in a plant that processes milk, soy, tree nut, wheat, peanut, and egg products. Consume Combat Crunch Bars any time you desire a great tasting, high protein snack. If you are used to Quest Bars then you will love these even more possibly. Combat Crunch Bars have a number of unique benefits such as a chocolate coating, baked cookie interior, plus superb taste in every single flavour. Combat Crunch Bars have a soft texture and multiple layers in each bar which sets these bars apart from the legions of bars out there resembling a concrete block. These bars have repeatedly been voted the favourite when we have done blinded taste tests against other low carb bars and now they are our best selling bar of all. Combat Crunch bars can be consumed at any time of the day as a snack or healthy treat between meals. Equally well suited to those who are dieting or seeking muscle courtesy of their high whey protein content. Anyone who enjoys eating their protein rather than drinking it will not find a better tasting, better textured bar than the Combat Crunch Bar. Our best seller, this bar is perfect for all ages and sexes. MusclePharm aims to set a new standard with its recently released Combat Crunch Bars. How are these bars different? Well, they are probably one of the most delicious bars that we have ever tried. If it wasn’t for the whooping 20g of quality protein in each bar and the low net carbs, we would have probably thought they were a cheat treat! MusclePharm goes against the smooth chewy bars and comes up with a crunchy deliciousness. Combat Crunch vs Quest Bars - What's the Difference? Since Combat Crunch Bars were first introduced they have proven to be an instant hit. As a protein bar which uses the sweet tasting fibre isomalto-oligosaccharides (IMO), Combat Crunch Bars deliver 20g of protein but with minimal sugar. This trend for low carb, high protein bars was popularised first by Quest Nutrition but the Combat Crunch Bar has a number of differences to Quest that may make it preferable for some. Combat Crunch Bars feature multiple layers and at the centre, a soft baked cookie. Nobody is going to complain about that! Combat Crunch Bars uses IMO while Quest now use soluble corn fibre. Combat Crunch features whey protein in higher amounts while Quest uses higher amounts of milk protein. The range of flavours are smaller in Combat Crunch but the feedback is consistently excellent across all flavours. Having munched on these bars since they first came out we have to say that our favourites are the cinnamon twist and chocolate peanut butter cup but they all follow the same template of high quality ingredients, and the use of a coated layer and cookie interior. We recently put Combat Crunch Bars in a blind taste test against 3 other low carb bars at an event at our flagship retail store in Leeds and they came out as the number 1 with more than 50% of people preferring this to the other bars we sampled (R-Bars, Quest Bars, and Gourmet Cheesecake Bars). 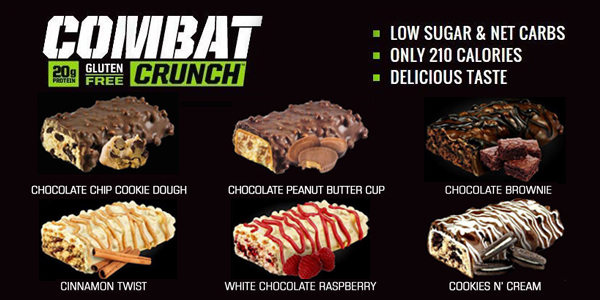 As well as tasting the best according, Combat Crunch Bars have also recently become our best selling protein bar. Having held this title for some time in our retail store, MusclePharm's bar is also now the number 1 in online sales. With new flavours coming out all the time, expect to see these bars grow in popularity VERY fast. Bars are not as fulfilling and lack the old substantial feeling to the bar. They are ok, but nothing to get excited about. Birthday cake had an obvious ginger taste, not a fan of that surprise. I like these as it curbs my sweet tooth. They don't exactly taste like other chocolate based protein bars but I have got used to these. The Birthday cake flavour is good and the bar is filling as a mid afternoon snack. This flavour was on offer so I can't complain whatsoever. I got these with the points I've accumulated and was pleased with the texture and taste. They are ginger based in flavour which I like. Not sure I would pay money for this flavour but for free it is a great protein snack! Great tasting bar at a great price. Will definitely buy again as I've tried various bars but this wins on taste. Although I've tried lots of the different brands on the market, these are still my favourite. Chocolate Cake is very chocolatey and definitely satisfies any chocolate cravings. Cookies & Cream flavour is another winner from Combat Crunch. They’re rich and creamy and have a very pleasing texture – rather softer than some of the other Combat Crunch varieties but nonetheless very satisfying. They’re coated in not one but TWO layers of chocolate - both milk and white – so how’s that for decadent! You’ll feel like you’ve died and gone to chocolate heaven. With Oh Yeah One and Grenade Carb Killa one of the best protein bars I know. Favourite flavors: Cookie Dough and Peanut Butter Cup! Chocolate coconut is the one!! I’ve tried three flavours so far, chocolate coconut, cinnamon twist and birthday cake! I was a bit disappointed by the flavour of birthday cake, didn’t think it had much, the other two are insane though! All combat crunch bars have the same great texture!! Great tasting coated protein bar. Lots of flavours to choose from. Each bar is coated with crispy pieces and has great macros! The birthday cake is really good. Quality protein bars. I was a little wary of trying the Combat Crunch White Chocolate Raspberry as I feared it might be a little sickly – however, it’s as delicious as any of the others in the range. With its crunchy crispies and flavours of cream and fresh raspberry, it’s very reminiscent of a raspberry pavlova. It’s a dessert in a bar! The best bars on the market for me, just edging out One bars. Cinnamon Twist is one of the best things I've ever tasted. I gave these a try while I was on a protein bar kick and I was pleasantly surprised by this product. I thought it would be dry and tough to get down from the look of it but I found that was not the case. While I don’t know if it was quite like “eating a soft-batch cookie” it wasn’t that far off, as far as protein bars go. There are 20g of protein and 12g of fibre for 210 calories, which is good for a sweet snack, but this bar also has a good deal of fat. It’s also a bit heavy and filling – which isn’t necessarily a negative point. A good option when you're craving sweets but don’t want actual candy. I would definitely recommend this for those shopping for protein bars. Really good bars. They aren't snickers, but they're the best tasting protein bars I've had. The wrapper makes these look inviting but the truth is they look nothing like it when opened. Everyone’s taste buds are different and mine didn’t take to this brand at all in any flavour. A little on the chewy side, but these fill you up unlike some other protein bars on the market. A little on the chewy side, but these fill you up unlike other protein bars on the market. Quite palatable and very chewy. Goes down well with either a hot drink or water. Combat Crunch Birthday Cake – Cause For Celebration! The birthday cakes of my childhood were a nightmare of white sugar, artificial vanilla flavour and cheap jam but birthday cake flavour Combat Crunch are another thing entirely. The filling – which is dense, toothsome and satisfying – has a somewhat cakey flavour with a faint tang of fruit. The coating is white chocolate with crispies and makes a great accompaniment to the inner. I took these to a family birthday recently instead of a cake and they were very well-received! The coating is very much like icing, unfortunately the middle is tough and bland. I've tried protein bars from a few different companies and can honestly say this was one of the best tasting ones I've had. It's not hard either so easier to chew on than some I've had in the past. Best bars on the market for overall taste and texture. Chocolate Chip Cookie Dough and Chocolate Peanut Butter are my favourites. Great price especially when deals are on such as BOGOHP or buy 3 for the price of 2. Difficult to stop at eating just one. Combat Crunch – Best Of The Bunch! Combat Crunch – what can I say?! The chocolate coconut ones consist of a chewy, satisfying inner with a coating of white chocolate and crispies. The chocolate peanut butter ones, on the other hand, are like a mash-up between a plain chocolate Ferrero Rocher (can I say that?) and a Snickers bar that’s been allowed to get a bit warm. Combat Crunch may be the product that’s most like a confectionery bar, and are a good introduction to the world of protein snacks. Ohh yeah, for sure this is a real treat, so darn tasty. No wonder it's called birthday cake, it's an all day party in your mouth! Might give you a jaw ache if you leave them in the fridge but a great meal replacement and really tasty. A bit on the hard/chewy side but tastes nice and is filling. Also doesn't upset the stomach like some bars can. Worth a try. These bars are the tastiest bars on the market and the macros are perfect. My favourites are birthday cake and cinnamon bun :) seriously satisfying and taste so good! Tasty bars with a good macro split. Very crumbly and not easy to eat but very good apart from that. Please get peanut butter back in stock! I have tried a lot of protein bars but this is by far the overall best when taking into account taste and macros. Absolutely delicious. I eat these after a bike ride and they are a real treat. Can't beat these, better than Quest for taste and better than carb killa for macros. Best tasting protein bar i've ever tasted literally just tastes like a chocolate bar. Chocolate peanut cup flavour was unreal. would recommend! Awesome cake like inside with a little crunch. I've tried the brownie and cookies & cream and am about to re-order and check some other flavours. Tastes like a Candy Bar. Benefits of a protein bar. Cookie Dough flavour was unreal, texture is so soft and just like a chocolate bar. Had to have some serious willpower to not blow through a box in 5 days! Will definitely be getting these again. These bars have an excellent nutrition profile but more than that, more dangerous than that, is the taste. The Chocolate PB cup is my Achilles heel, incredibly tasty, good texture and satisfying to eat. These can quickly disappear if your discipline is as bad as mine. I definitely recommend these, but beware their addictive nature as it could undo your hard work! Chocolate peanut butter - they have more calories than a quest bar, but in a blind tasting they would hold up against a simple chocolate bar. Nice chewy texture without being too much work, and the chocolate coating makes a good change.